I began telling you all about our big Harry Potter birthday plans a few weeks ago. Now that the party has come and gone, I'm working on getting everything into a sharable format. I collected ideas for months, so it's taking a little sifting to remember where I found things and time to clean up files, but I'd like to share as many of the details with you as possible. The first part of our plan was to surprise the boys with an Owl Post delivery. The letter didn't have to arrive on Jonathan's birthday because most wizards just get theirs some time in the summer--It just happened that Harry's birthday was in the summer. We chose to have the owl arrive a couple of weeks before their birthdays, so I could finish up the party planning without having to keep it hidden. If we hadn't done this, I definitely couldn't have added in so many details at the end. It just wouldn't have happened. 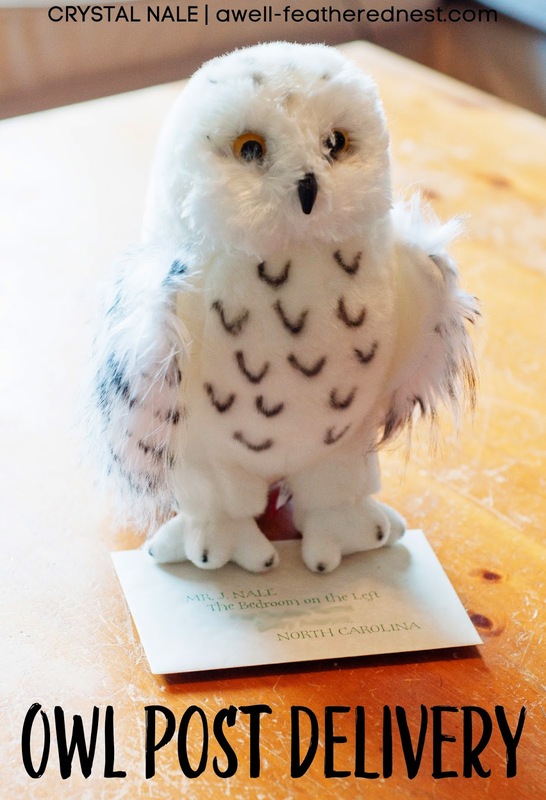 Justin took the boys out for an errand, and when they arrived home, Hedwig was waiting on the coffee table with an owl post letter addressed to Jonathan. When he opened it up, there was a letter inviting him to a "short term" at Hogwarts. It had post scripts telling him to invite his brother along and to visit their Disney friends while he's in the area. Instead of the list of supplies, he had a page with a clue included in his envelope. I was hoping for a big burst of excitement, but it was funny because they didn't realize the trip was real until several clues later. There were clues that led them inside and out to find all of their birthday gifts from us. It was the Universal and Disney park maps found in their underwear drawer that finally convinced them there really would be a trip. The final clue explained that, since the trip is still a while off, they would be having a Hogwarts birthday party a few weeks later. I'm so glad we did that because it was fun having them help to plan and finish up the decorations. 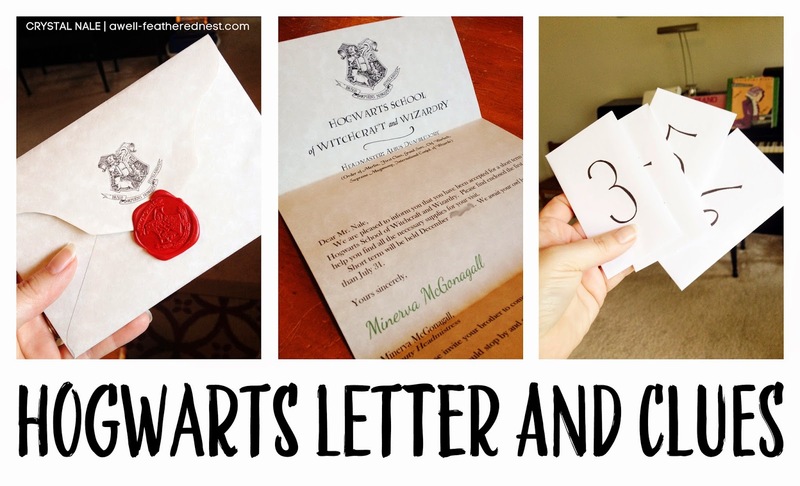 The main things I had to do for this part of the plan were to create the Hogwarts letter, first clue page, and envelope then print our clues and place them into some tiny envelopes. I put together my letter mostly by using different fonts and consulting the Sorcerer's Stone for the wording. There are tons of examples online, but I'm sharing a couple of things that might help make the process easier. These are PNG files of the letterhead and the footer I created that can be inserted into any word processing document. You can use these, add your own wording for the body of the letter, and customize it however you'd like. Click here to download the letterhead for the main page of the letter. Click here to download the letterhead for additional pages. Click here to download the footer. If first made my envelope by using a template I put together. I traced mine onto some parchment paper to make it look more authentic. I folded the flaps and secured it with scrapbook adhesive. I then measured the width of the finished envelope and adjusted my letter accordingly. I increased the margin on the right, so I could trim the page to about a 6 inch width. I printed the letter pages onto the same parchment paper, trimmed the width, and folded them to fit into the envelope. 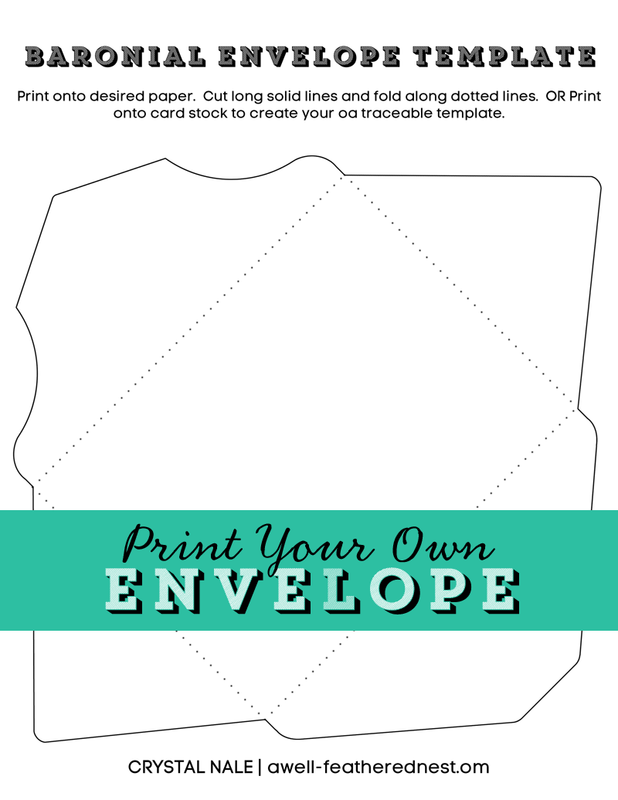 You can click here to download the envelope template. Once the letter was all packaged, I used a real wax seal to close it all up. For an easier and less spendy alternative, you can find printable wax seals here. Just print them, cut them out, and affix them to the flap of your envelope. You'll just need to address your envelope for your special person, then it will be ready for the Owl Post. Are you planning a Harry Potter party? Have you ever given someone a Hogwarts letter? There are lots of details about the birthday party on the way! So helpful! Thanks! We are using the letterhead for a prom proposal. Oh, Ashley, that it awesome! I'm so glad to play a part in such a special moment!